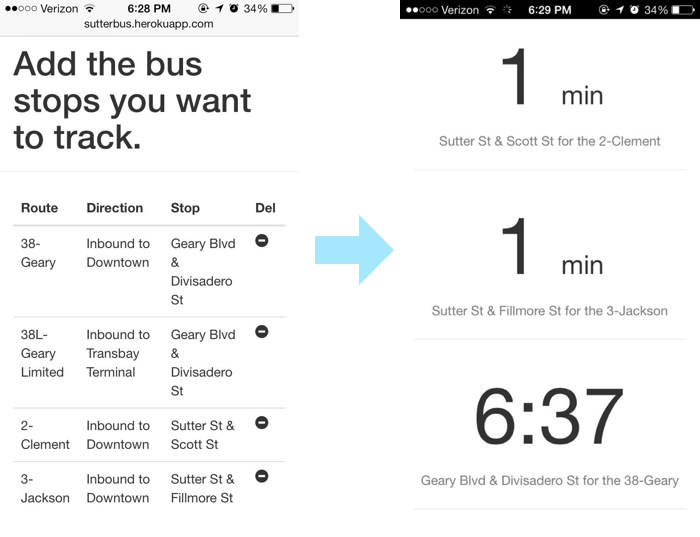 If you take the muni on a daily basis, it can be a hassle checking bus prediction web sites/apps for your various routes and stops to get an estimation of when your next bus will arrive. This app requires one time setup, where you select the bus routes and the stops that you frequently take. It will then generate a unique URL (that you can book mark or save onto your phone) that will display real time prediction data for your selected routes and stops. Go here either on your mobile Safari or on a desk top web browser. Select the routes and the bus stops that you primarily frequent. Hit the button and a unique URL will be generated for you (so you should save this one to your home screen to easily retrieve it in the future). I used NextBus's XML Feed to get the muni predictions.